Joerg Breitenfeld was born in Berlin, Germany during the Cold War. Being born in this era made it difficult for him to connect to the outside world. As a young man Joerg was invited by Greg D Zygmont to visit his family in the United States. Greg was an exchange student and a film nerd just like Joerg. 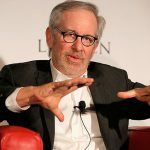 His trip to the United States would him help become a Steven Spielberg fanatic and also influence the creation of his website, StevenSpielbergChronicles.com. Joerg Breitenfeld is one of the true pioneers of online film fandom and his devotion to the work of Steven Spielberg is obviously something I greatly appreciate. I spoke to Joerg about his numerous contributions to film fandom, his thoughts on the current state of Spielberg appreciation and what he hopes to accomplish next. You were introduced to Steven Spielberg and his work when you visited the United States when you were 19. 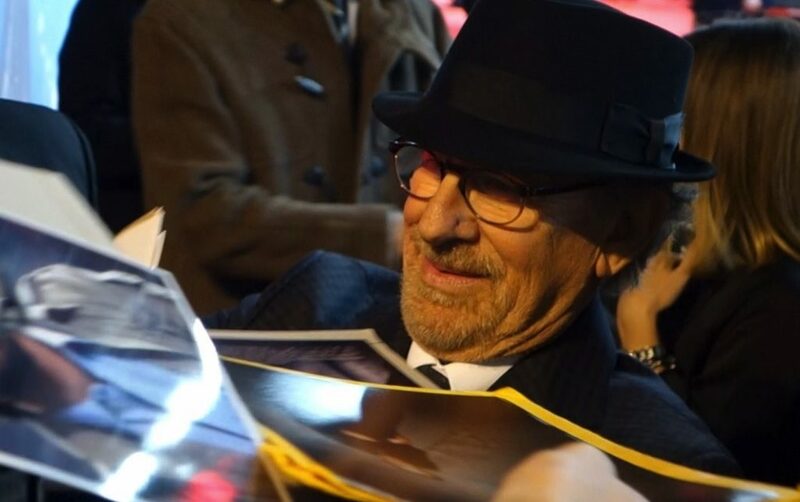 Do you think being introduced to Spielberg at an older age changed your appreciation for him? For a lot of kids that grew up in America, being aware of Steven Spielberg happened a lot younger. Before his work really hit me in the gut I was an active admirer of the first three Star Wars films and the James Bond film series. From early on, the guys behind the camera, sound, visual effects, set design and music were my idols. I devoured magazines such as cinefex and American Cinematographer and dreamed of becoming a filmmaker – like so many of us, I guess. So, when I was properly introduced to the works of Spielberg I watched them with the eyes of someone who knew about the tricks of the trade, to some extent at least. And I was transfixed immediately. I became aware I had watched Duel on TV when I was about ten and it scared the hell out of me! But, I had no idea who made it. But there is another reason why Spielberg and his films had such a profound, if belated, effect on me. At that time my hometown West Berlin was surrounded by the Berlin Wall and thereby cut off from the outside world. The only way out was on limited transit routes through the German Democratic Republic – or by plane. So, it was a life-changing experience when I was invited by an exchange student’s family to spend four weeks at their house in the suburbs of Pennsylvania. My first transatlantic flight! It was the summer of 1982, a magic year for all connoisseurs of fantastic films. Spielberg gems such as Raiders of the Lost Ark, E.T. the Extraterrestrial and Poltergeist were running in US theatres. And I was watching them all in a row! In their original version – on really big screens – in Spielberg’s home country! I will never forget this summer. I owe so much to the Zygmont family and their invitation to Philadelphia. 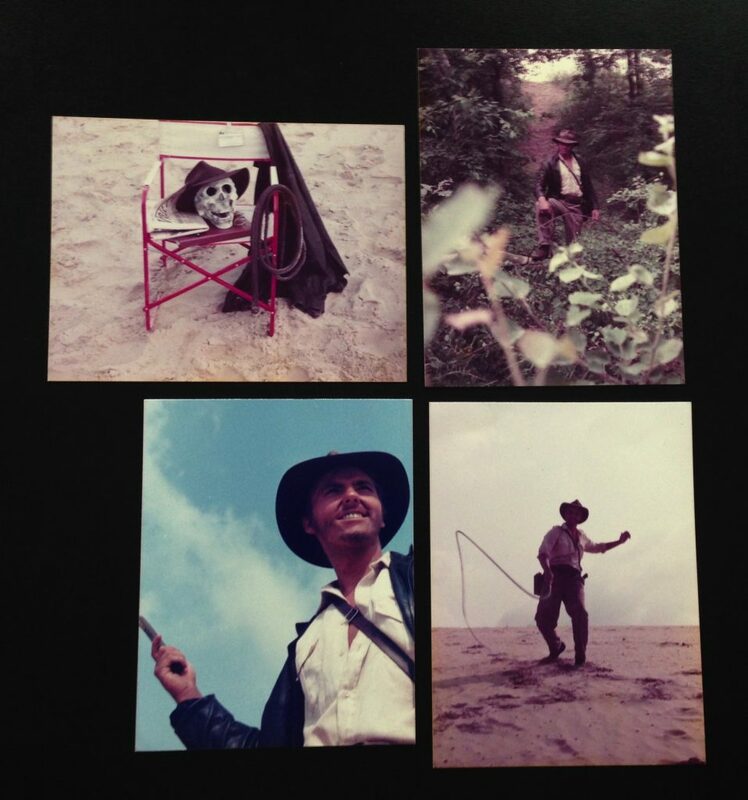 That trip to the United States made such an impact on you that you made an Indiana Jones short film when you returned home. How did you view the character of Indiana Jones when you made the short and did creating an Indiana Jones project help you to understand the character better? Well, when my friends and I prepared our first amateur film in early 1984, we got into a quite experimental mood, and the project took very different shapes. Using Raiders of the Lost Ark as a starting point, the first and only available part of the series, we even played with the idea of killing off our hero! I viewed the character as a restless explorer craving absolute knowledge and wisdom, similar to Irina Spalko in 2008’s Kingdom of the Crystal Skull. Ignoring the warning signs, our Indy would ultimately meet his doom. We were lucky to have assembled a highly dedicated team of amateurs. My classmate Joerg Liemann owned a Super 8 camera, two lights, a film splicer (editing system) and a projector. Our most talented cast even brought their own costumes. Joerg L and I were the creative driving force. Originally, we went for a spoof featurette called “The Making of Indiana Jokes and the Temple of Zoom,” an obvious nod to a certain Indiana Jones adventure that was to be released in German theaters five months later. Our “Making of” parody would include selected “footage” and fake interviews. This idea slowly fell apart. The more we shot, the more we felt like we had to do a serious feature film. So, we began to develop an original script for what we called Indiana Jones and the Key to Atlantis (the adventure game Indiana Jones and the Fate of Atlantis would be released eight years later). We had the hero chasing for a map of an undiscovered island named Zipangu, which turns out to be Atlantis. Our Indy would be entangled with two women: blonde, smart and sassy Vivian, modeled after Raiders’ Marion, and a dark-haired femme fatale. We made Vivian the leader of an expedition to Vinland searching for Thor’s hammer! We had her meet Indy at Rick’s Café in Casablanca. There were a lot of crazy ideas and we even tried to somehow resurrect the character of Indy’s rival Forrestal. All scenes had to be shot in West Berlin, which was still enclosed by the wall. So, choices for exotic-looking locations were somehow limited. We used a climbing rock and cellar vaults for what was meant to be the exteriors and interiors of a “temple.” Our local forest doubled for the Amazon jungle (in Winter for Vinland). Scenes that were meant to be located in some remote desert were filmed at an abandoned tank training ground. You get the picture. In the end, the feature film experiment didn’t turn out as expected since parts of cast and crew were not available all the time. We wanted to salvage what we had shot so far, so Joerg L and I compiled the scenes for a trailer promoting an Indiana Jones adventure that would never be made. I’d still love to see how some of our ideas would look on film. Although our dream of a feature film (and becoming professional filmmakers) remained unfulfilled, there were invaluable side effects. We had a big premiere party and most of us are still close friends. We eventually made another film and we met legendary visual effects artist Dennis Muren. 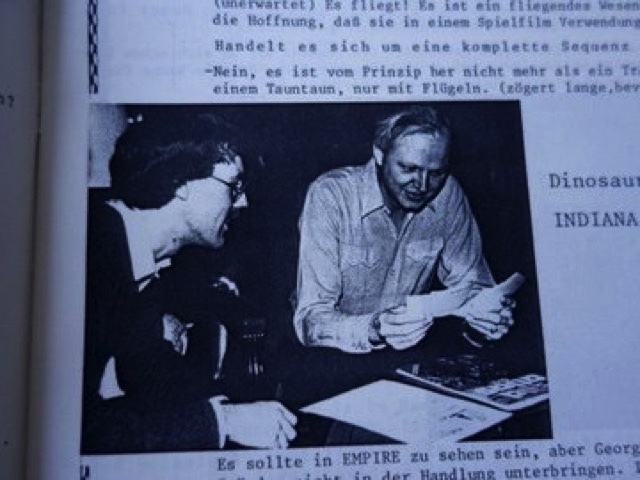 During his visit of the Berlin Film Festival in 1985, Joerg L and I told him about our Indiana Jones film. Dennis got so excited that he signed our set photo and invited us for a 1 hour interview. An incredible experience! You made a film related magazine at a young age and before the internet was dominating how media was created and shared. Obviously technology and social media has changed film appreciation and fandom greatly. What kind of things did you learn when you were putting together that magazine that stuck with you? After having published the Star Wars related fanzine, Skywalking, for a couple of years, I felt the urge to do something different. So, I was very happy when the Spielberg Express founder begged me to take over his fanzine in 1986. 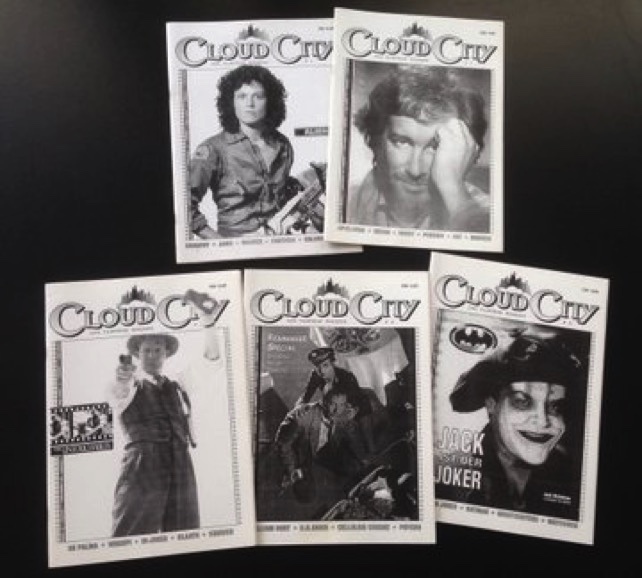 So, I asked Joerg L to join the editorial team, we expanded the scope of film topics and gave it another title: Cloud City. Back then, fanzines were handcrafted with a typewriter or a dot matrix printer, drawing pen, scissors and mounting adhesive. They were duplicated in copy shops and sent out in envelopes. With no Internet available, we collated news about Spielberg projects and other films from sources such as Variety, and magazines like Premiere and Photoplay UK. We also watched classics such as Hitchcock’s Psycho on VHS and analyzed them image by image. To create screen shots we placed an analog photo camera in front of the TV set and paused the video cassette. So, I learned quite a lot that has stuck with me until today. 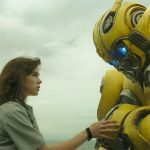 How to dig up film news from all kinds of sources, meet and discuss with different kinds of film fans until late in the night, draw fancy headlines or illustrations, create layouts, review films and music, write vast amounts of text and answer those beloved letters coming in from our readers. All this was somehow more “physical” than today but it was not altogether different. Except, now I have to filter away all the click bait, whereas in the analogue age, we were happy when we found some valuable news clips. When and why did you decide to create the StevenSpielbergChronicles.com? 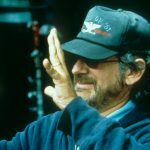 After Steven Awalt, the guiding spirit of all Spielberg fans, sadly shut down his site Spielbergfilms.com around 2001, I felt a void (until he wrote his fabulous book “Steven Spielberg and Duel: The Making of a Film Career”). 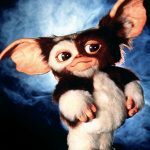 I was aware of other superb Spielberg related websites such as TheBeardedTrio.com and TheRaider.net. But, I yearned for a specific “one-stop” source for all Spielberg related information. I eventually decided to set up my own Spielberg website. Its title was inspired by the TV series The Young Indiana Jones Chronicles. 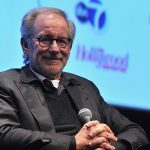 StevenSpielbergChronicles.com is conceived as an interactive biography and filmography, providing relevant Spielberg related life events in chronological order, sorted by decades. It starts in 1850 (when Spielberg’s paternal family roots lead back to Austria-Hungary) going all the way up to 2018 when 71-year-old Spielberg prepares his first film musical West Side Story. On the way through time I also wanted to show how other people and events may have influenced Spielberg, so I included milestones in history and mass communication as well as selected films by other directors. In short: I wanted to make visitors of my website to get “the whole picture”. 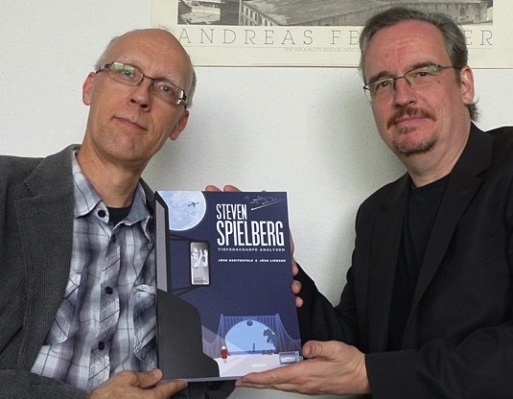 You have your very own book out now that is currently only available in German—Steven Spielberg – Deep Focus Analysis. What was the main reason why you wanted to write a book? 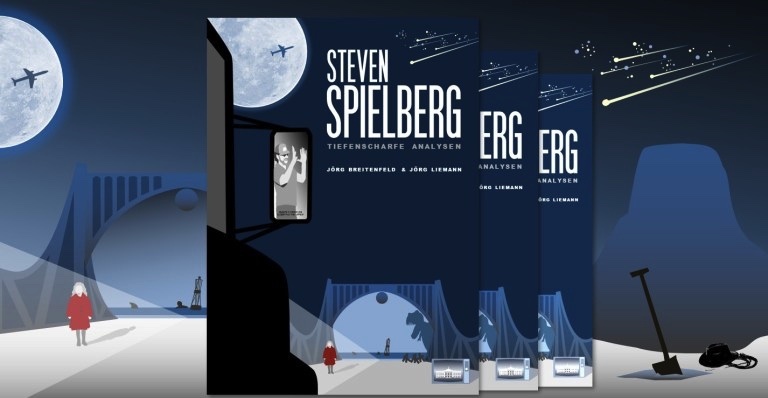 As you may have noticed Joerg L and I have created all kinds of stuff together, and we continue to do so, including our book about Spielberg. The two of us are crazy for movies since the day we met in school and we regularly watch and discuss Spielberg’s films. We also love films by other directors such as Terry Gilliam, Stanley Kubrick, Woody Allen, François Truffaut and Alfred Hitchcock. There is one book that Joerg L and I have both cherished since the 1980s: Hitchcock/Truffaut. It documents a remarkable exchange between the two directors who spent a week in a room at Universal Studios talking about movies. It really opened our eyes and taught us so much about the craft of filmmaking. I am sure Spielberg also knows this book inside and out. So, we wondered why we couldn’t find a book about all Spielberg-directed films that was as entertaining and instructive as Hitchcock/Truffaut. Of course, there were tons of Spielberg biographies (the best one by far written by Joseph McBride) and even more books about specific films or aspects. In 1998, Joerg L sent me a letter (yes, e-mails were not yet commonplace) and suggested we write a book about the films of Steven Spielberg. In closing, he wrote: “I guess we should need no more than two years.” Well, it turned out we needed several more in order to catch up with Spielberg’s non-stop activity and to cover largely uncharted terrain such as his first short film Amblin’ and all his TV work. Joerg L even visited the TV museum in NYC to watch Spielberg-directed episodes that are available nowhere else. We’ve been digging up screenplays in order to find out more about Spielberg’s approach to adapting fictional or non-fictional literature. We were looking out for directors who influenced Spielberg and vice versa. We meticulously analyzed and compared each and every opening of his films as well as what we called his “suburbia trilogy” (Close Encounters, Poltergeist and E.T. the Extraterrestrial). We dived deep into aspects such as politics, religion and music. In the final chapter, we summarized all of his trademark themes, motifs and narrative techniques. 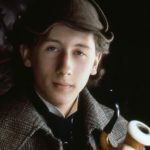 Quite similar to StevenSpielbergChronicles.com, we wanted to provide our readers with “the whole picture”. You are obviously one of the biggest and most knowledgeable Spielberg fans around. 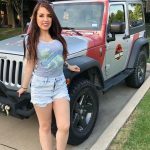 What do you think about the current state of Spielberg appreciation? Has the appreciation for his work changed over the years, especially since you became such a huge Spielberg fan? Thanks, Adam, very flattering indeed! I would like to express my gratitude for the incredible work you do for our fan community! Amblinroad.com is not only visually outstanding – your news, features and interviews are always a joy to read, revealing Spielberg related aspects previously unknown to me. To answer your question: Definitely yes. The way his audience, and especially his fans, are judging his recent films and his overall work has changed, and not by coincidence. Over time, Spielberg evolved from an entertainerto an educator. This does not mean his early films were pure “popcorn” followed by pure “arthouse” – but the emphasis is clearly shifting. Consequently, he would lose some of his earlier fans while increasing his movie’s appeal in other audience segments. He did not come to this conscious decision when he committed himself to direct Schindler’s List (1993), as some believe. It actually happened when he chose daring and underrated projects such as The Color Purple (1985) and Empire of the Sun (1987). Around that time he began to systematically switch between films leaning to “popcorn“ and films leaning to “arthouse.” I do not know any other director who does that in his fashion. His more serious films are basically “financed“ by his more entertaining films. You have done so much related to Steven Spielberg, is there anything else you are hoping to accomplish one day? It would be great to see an English-language version of our book in the nearest future. And I would love to meet Steven Spielberg privately someday and hand him our book.